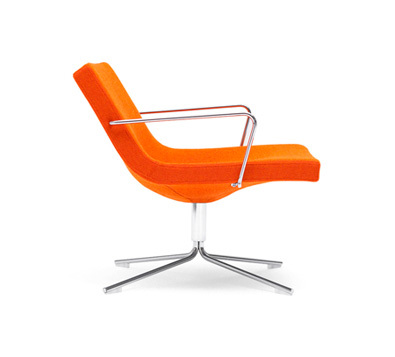 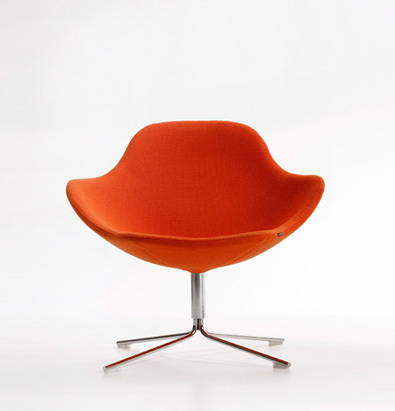 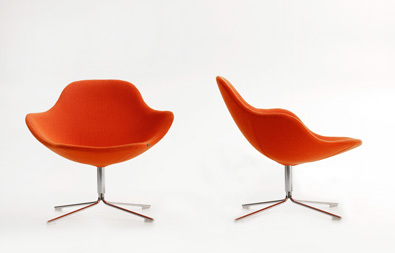 Design: Christophe Pillet. 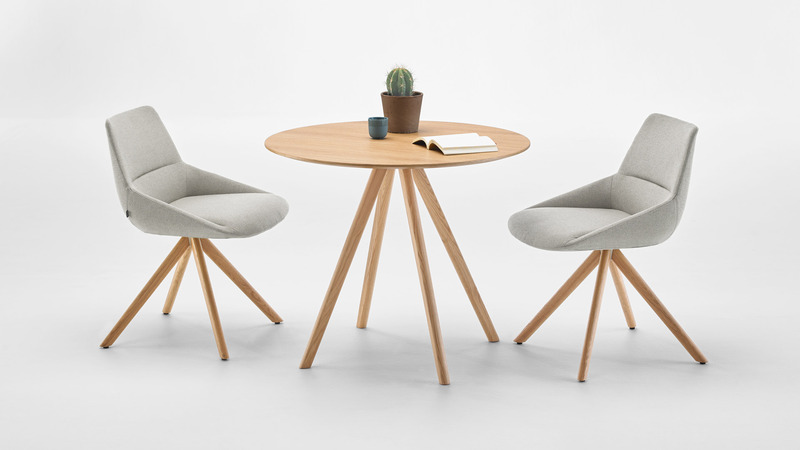 Chair and armchair with four-star Oak wood base, (made with an inner steel structure covered with Oak wood). 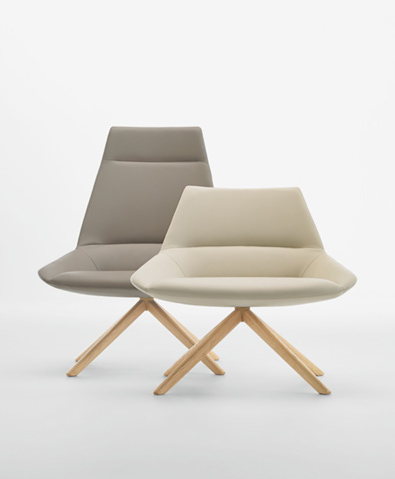 The seat shell features an inner steel structure covered in high-density, high-resilience injection moulded polyurethane foam, covered in the fabrics and leathers of the collection. Four star wooden bases finished in: natural oak, oak stained walnut, oak stained wengé, or lacquered black, white, anthracite, grey, red, green, brown, vison, or mustard. 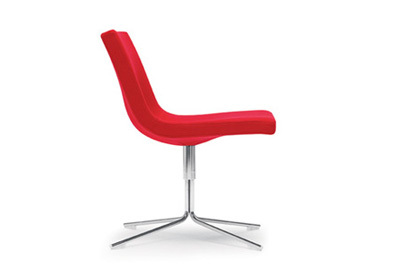 Design: Christophe Pillet. 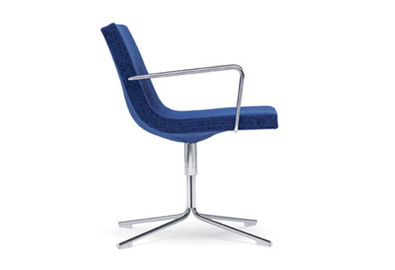 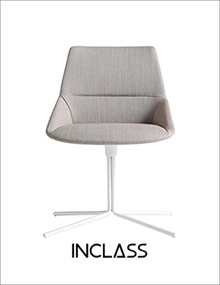 Sleek chair and armchair with four star flat swivel base in 18mm solid steel rod, finished in chrome, or thermoset polyester paint in any of the colors of the INCLASS collection. 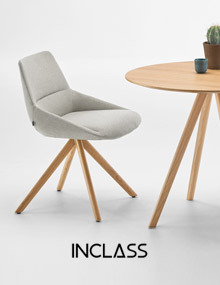 The seat shell features an inner steel structure covered in high-density, high-resilience injection moulded polyurethane foam, covered in the fabrics and leathers of the collection. 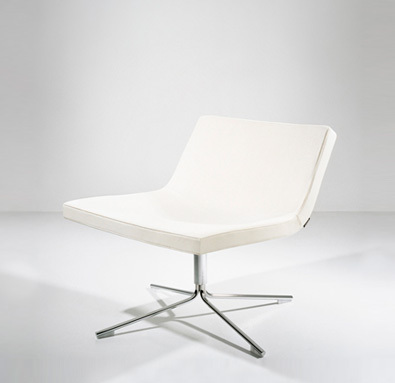 Design: Christophe Pillet. 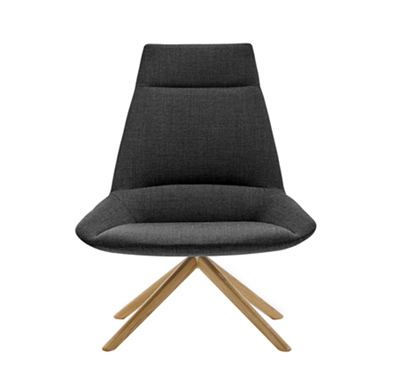 Swivel armchair in two heights with sleek sophisticated lines, and four-star Oak wood base in a variety of wood and lacquered finishes. 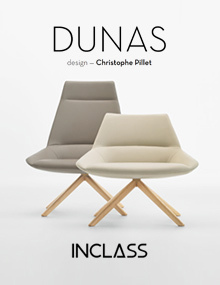 The seat shell features an inner steel structure covered in high-density, high-resilience injection moulded polyurethane foam, covered in the fabrics and leathers of the collection. 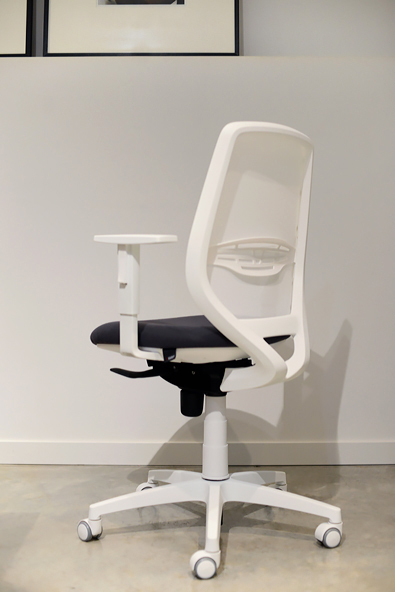 Comfortable and breathable task chair featuring a high mesh back, lumbar support, adjustable height and depth armrests, nylon base and self braking rubber castors. 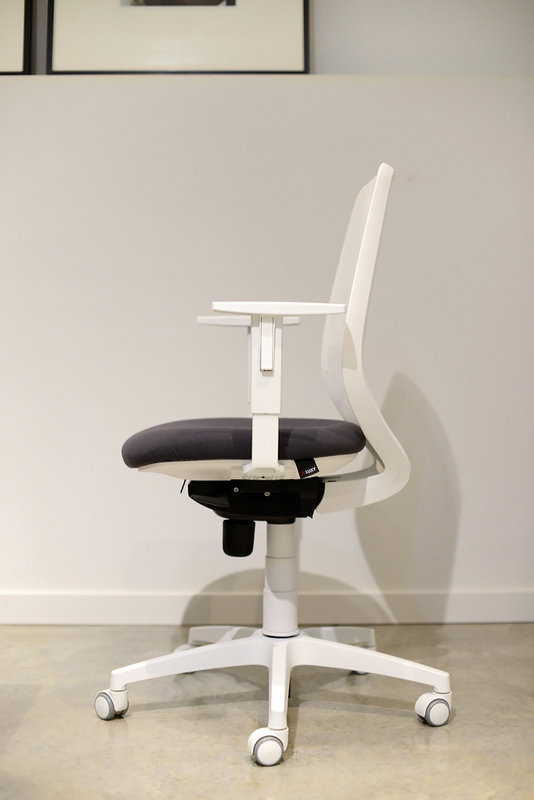 Syncrhon mechanism provides gas lift, tilt mechanism with 5 locking positions or unlocked backrest, and tilt tension adjustment. 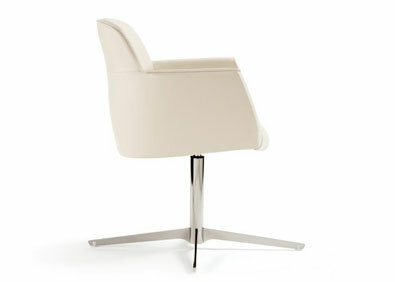 Available in black or white with your choice of seat fabric. 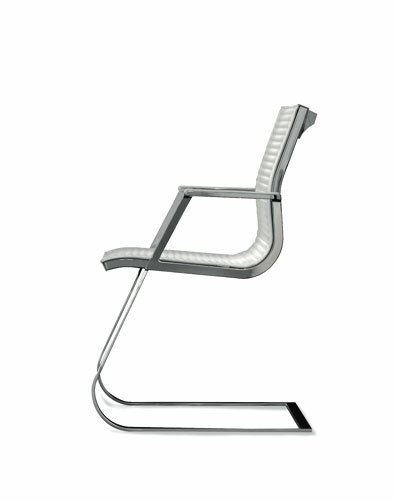 26.37" w x 24.8" d x 37.4" - 42.12"
seat height: 16.53" - 21.65"
arm height: 23.62" - 28.34"
Design: Doriana and Massimiliano Fuksas. 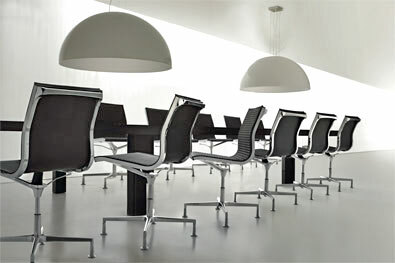 The Fuksas Studio, led by Massimiliano and Doriana Fuksas, is one of the most successful international architecture studios worldwide. 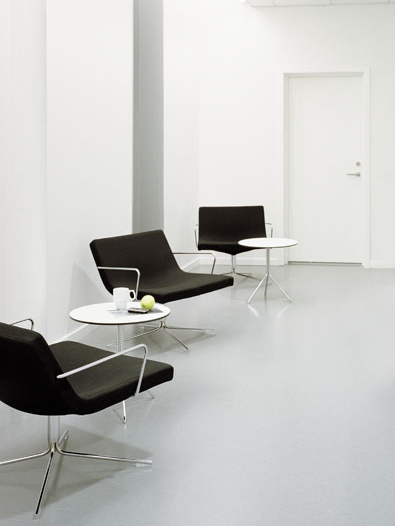 During the past 40 years the studio has developed an innovative approach through a surprising variety of works, ranging from the Shenzen Bao'An airport, museums, culture venues, music spaces, congress centres, offices, interiors, and private houses and design collections. 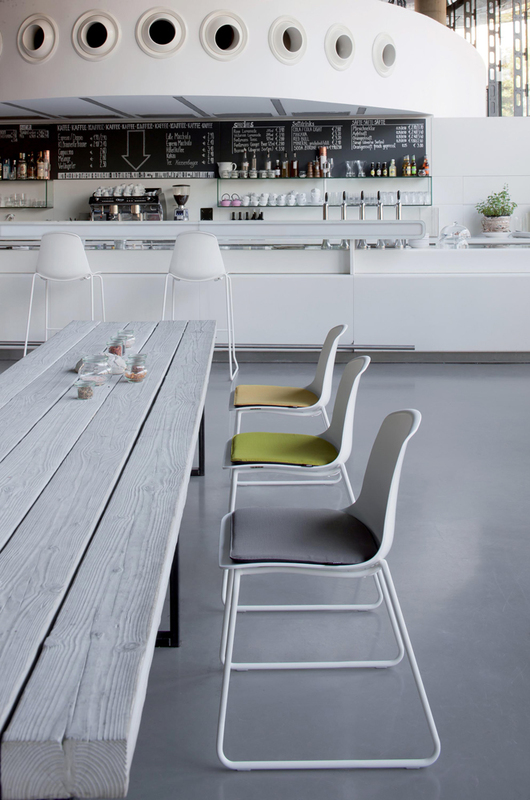 From large to small scale, the Fuksas Studio’s holistic approach allows for completely integrated project solutions. 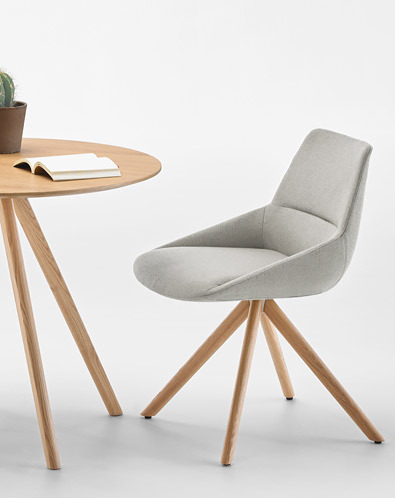 Instead of showing its whole ergonomic technology, the Bea chair incorporates everything in its flexible gracefully curved shell. 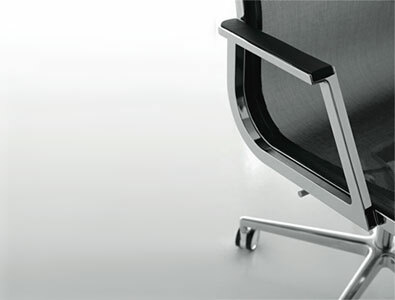 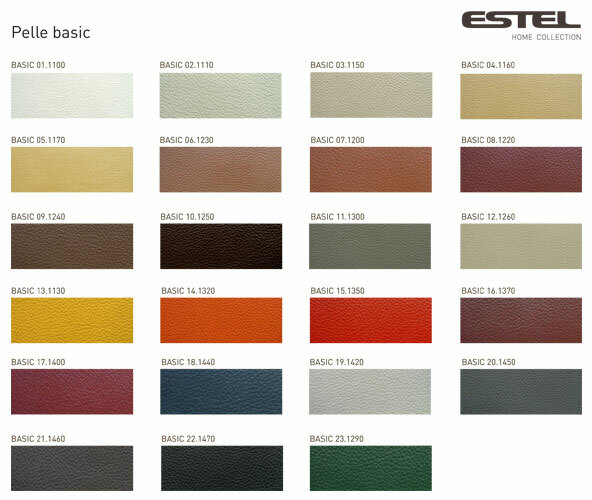 The seat complies with the strictest safety and ergonomic regulations: EN and ANSI-BIFMA. 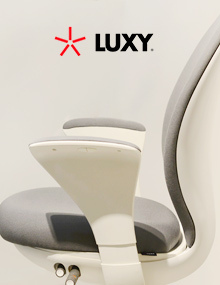 The inner Zytel® 80G33 frame is covered by a double loaded Pebax® sheath, a technology deriving from sport shoes. 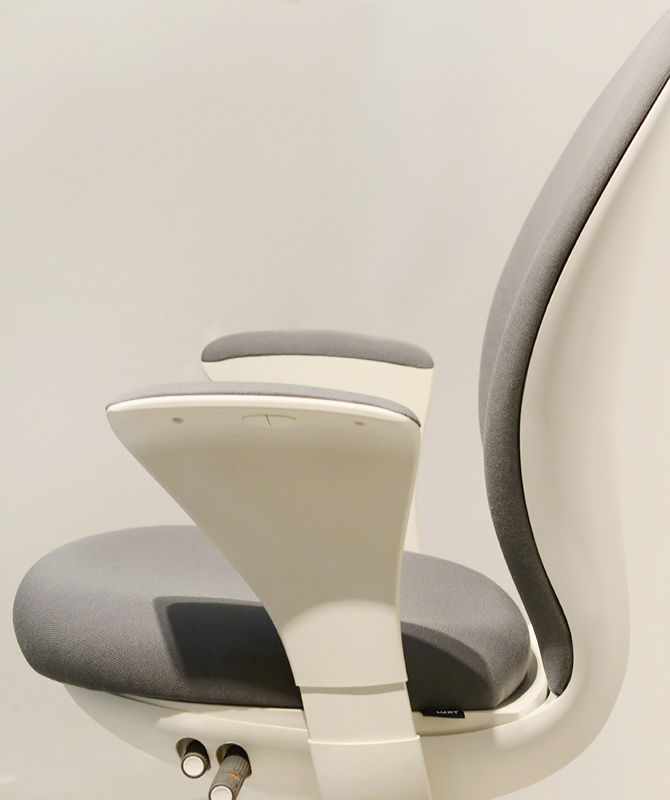 The synchronised BeaRevo mechanics with unblock/block functions is controlled by push & click buttons, offering lumbar adjustment, sliding seat, tension adjustment, height adjustment and adjustable armrests. 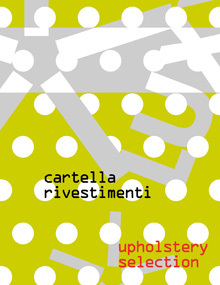 Design: Stefano Getzel. 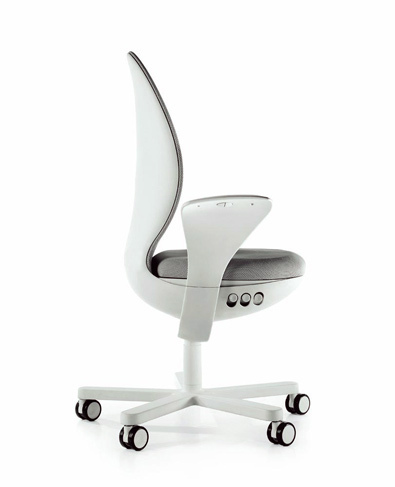 Sled base chair with tubular cantilevered steel frame, and polypropylene seat shell with glossy back, and front in embossed non slip finish. 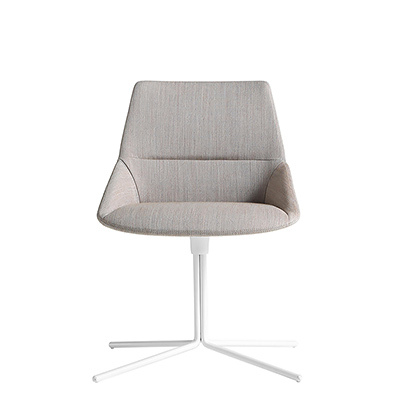 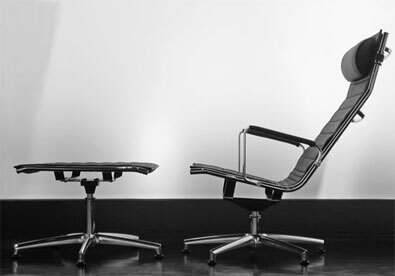 Made, tested, and certified in Italy to meet the demanding rigors of commercial use, but the Epoca chair's elegant simplicity and comfort also lends itself to high design residential environments. 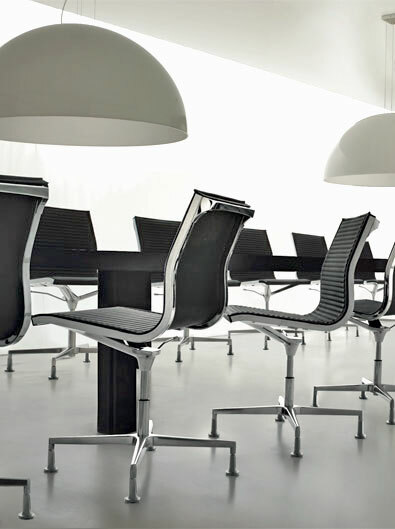 Screwless self assembly, stackable, optional non slip seat cushions. 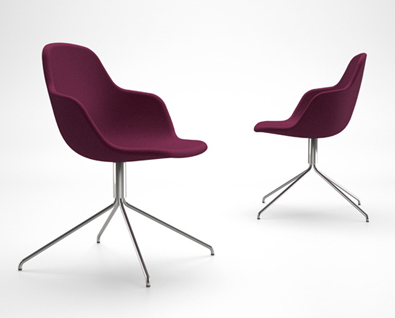 Design: Stefano Getzel. 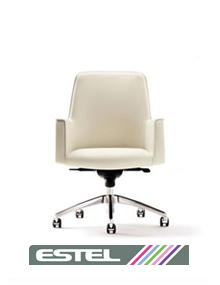 Gas lift task chair available in arm and armless versions, wtih partial ribbed upholstery, Polypropylene exterior seat shell, white Nylon base and white castors. 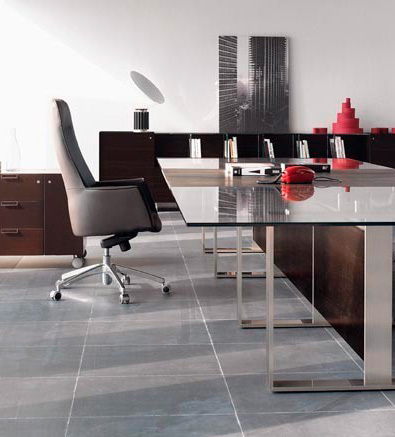 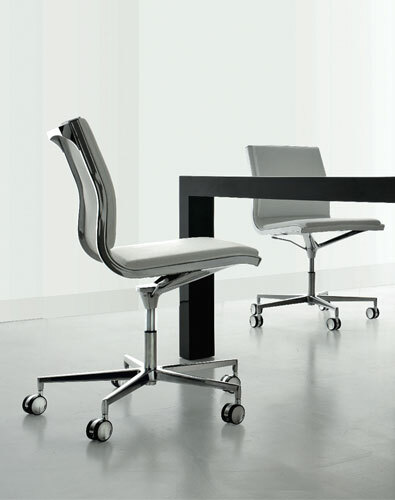 seat height: 15.35" - 20.47"
Deko's position as the Italian leader in office chairs enables it to offer luxurious collections with unsurpassed quality, design, and value. 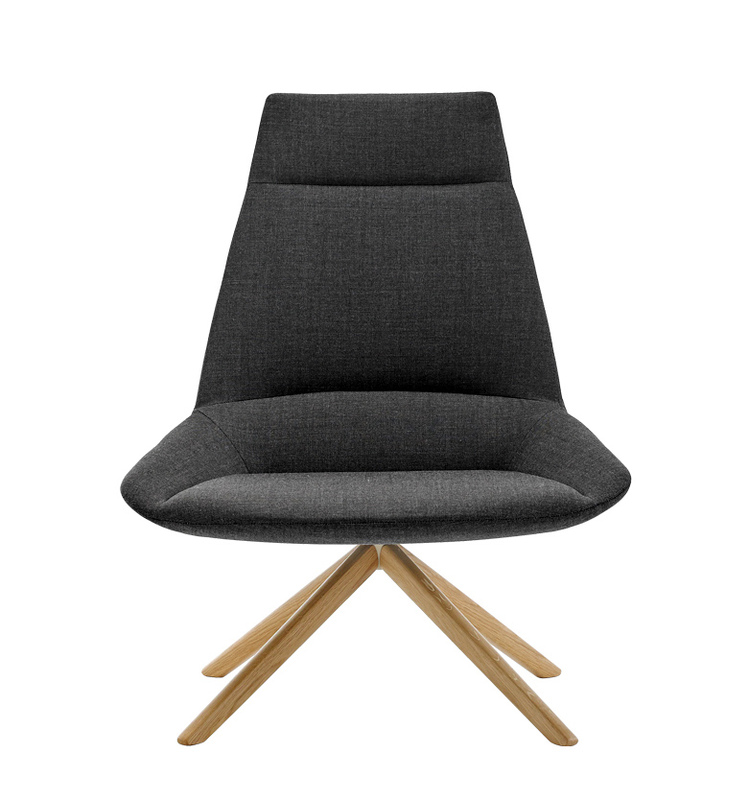 The Tulip collection of office chairs features an all-in-one seat and backrest made of padded and upholstered polyester foam, giving it a striking design and a high level of comfort. 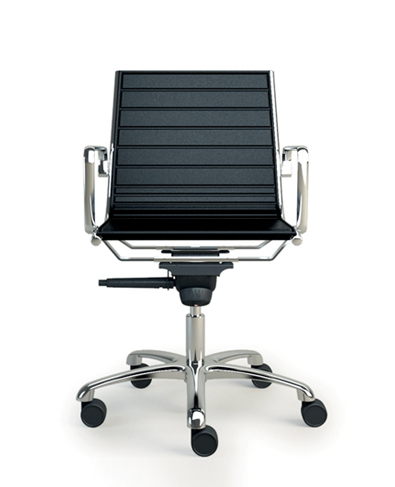 Standard version: with star base made of polished aluminum mounted on self-braking, hard or soft rubber swivel casters, and adjustable tension and tilt adjustment with rocking movement which can be locked in the horizontal position. 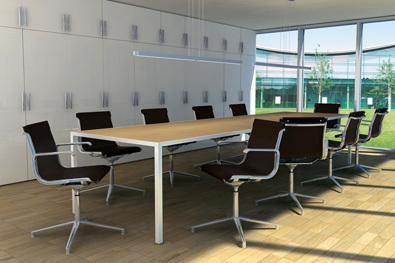 *Also available with cross shaped chromed base with glides for an additional up charge. 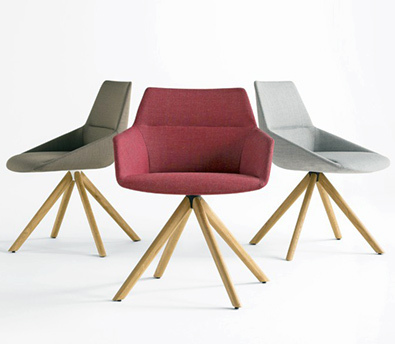 Each chair is available in either the standard smooth molded version or in the Tulip Cannete version with panelled stitching on the inner sides and backrests. 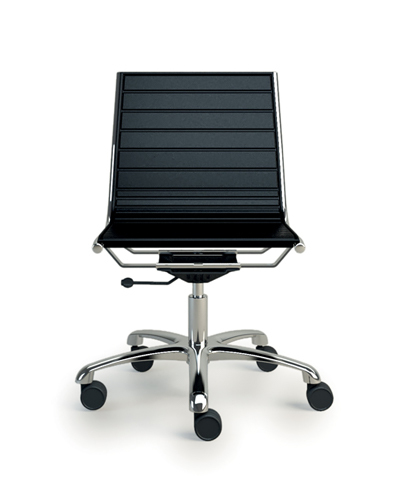 With star base made of polished aluminum mounted on self-braking, hard or soft rubber swivel casters, and adjustable tension and tilt adjustment with rocking movement which can be locked in the horizontal position. 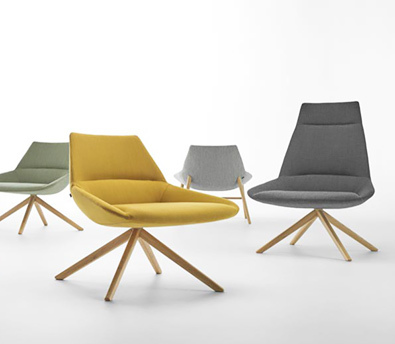 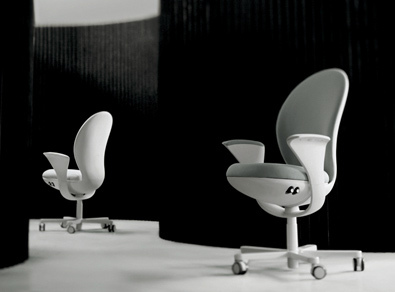 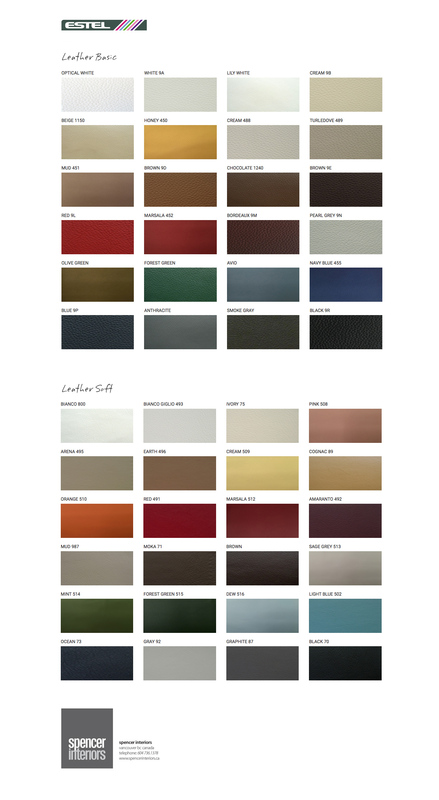 tailor-sewn finishings, functionality and ergonomics to create Taylor, a timeless refined chair. 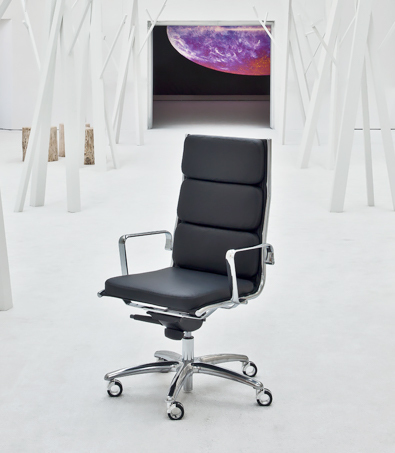 The particular attention paid to aesthetic detail and the quality of the materials used, make Taylord a unique and versatile chair that can be used in environments from management offices to home offices. 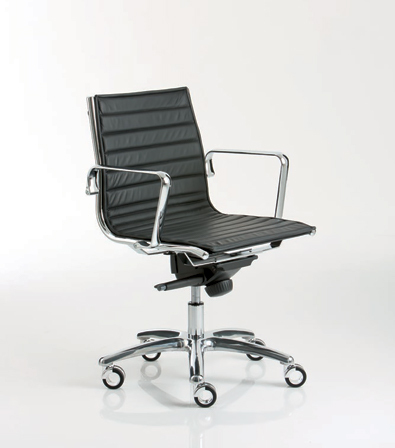 Shown in leather conference version with medium-high backrest with contrast stitching, chromed aluminum armrests, swivel, tilt mechanism, and 4 star polished aluminum base. 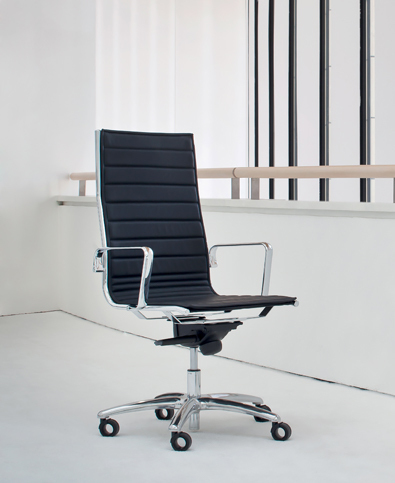 The Nulite chair refines the concept of the cast aluminum task chair, and combines Italian design with technological enhancements to create a compelling new addition to the category of work and home office seating. Available in 2 heights, with or without arms, with glides or self braking rubber castors, a decentralized multiblock synchron mechanism, and 3 coverings: thick padding, mesh, and a new heat bonded / cold pressed ribbed leather padding, which delivers precision finishing without any stitching - for a completely new and technically precise visual effect. 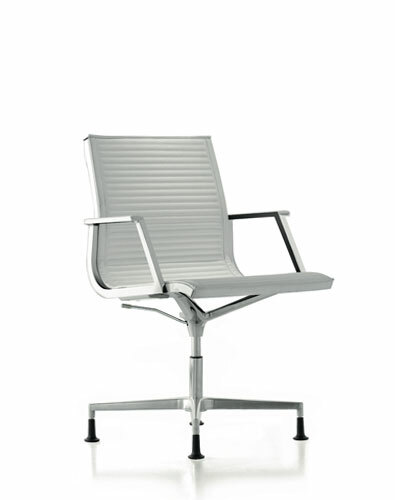 Standard frame finish is polished aluminum. 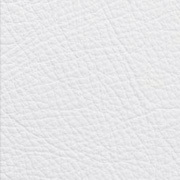 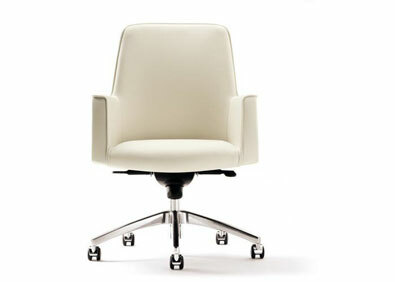 Optional glossy white finishing is available for an extra charge of $130.00 per chair. 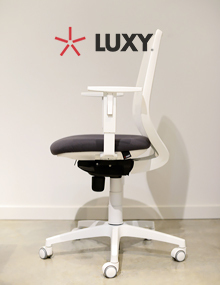 height: 36" | seat height: 18.3"
seat height: 16.53" to 20.47"
$1,660.00 | thick padded leather, gas lift, polished cast aluminum base. 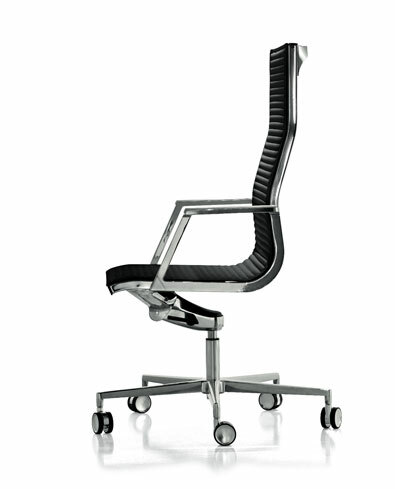 arm height: 24.02" to 27.95"
Upholstered high back armchair with cast Aluminum base, chromed structure, adjustable gas lift, eco-tilt mechanism, and fully removable cover in thin padded leather. 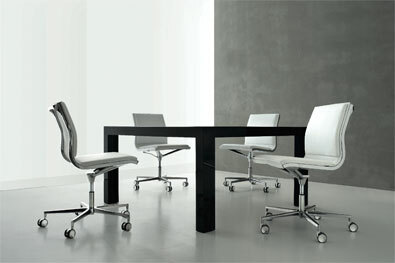 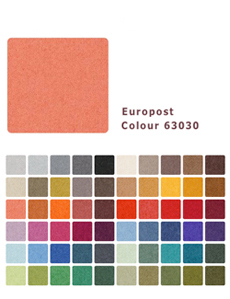 Available with castors or glides. 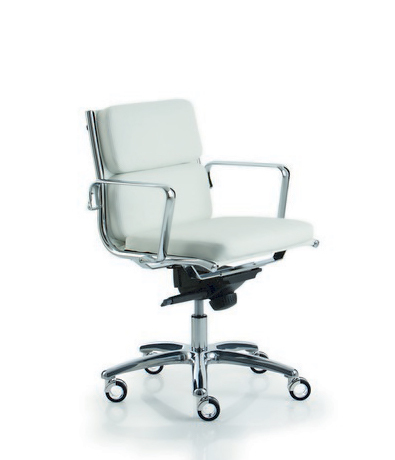 seat height: 19.09" - 21.85"
arm height: 27.16" - 29.92"
Upholstered high back armchair with cast Aluminum base, chromed structure, adjustable gas lift, multi block tilt and lock mechanism, and fully removable cover in thick padded leather. 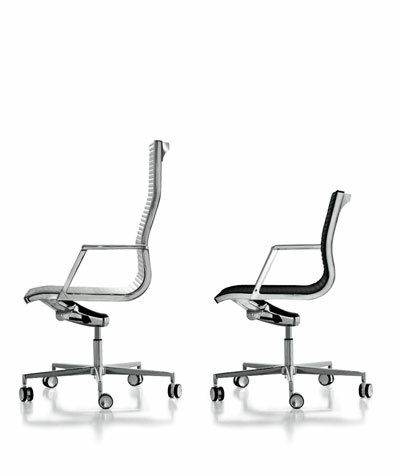 Available with castors or glides. 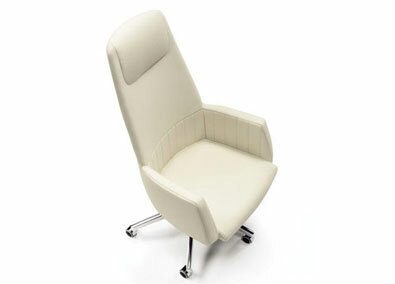 Upholstered armchair with cast Aluminum base, chromed structure, adjustable gas lift, multi block tilt and lock mechanism, and fully removable cover in thick padded leather. 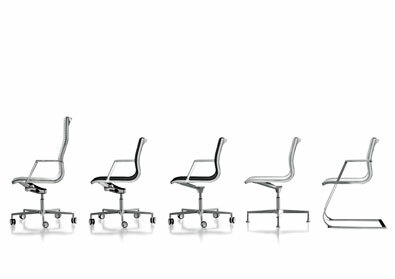 Available with castors or glides. 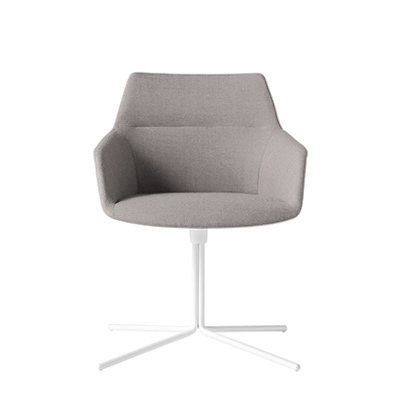 seat height: 17.91" - 20.66"
arm height: 26.77" - 29.52"
Upholstered armchair with cast Aluminum base, chromed structure, adjustable gas lift, eco-tilt mechanism, and fully removable cover in thin padded leather or fabric. 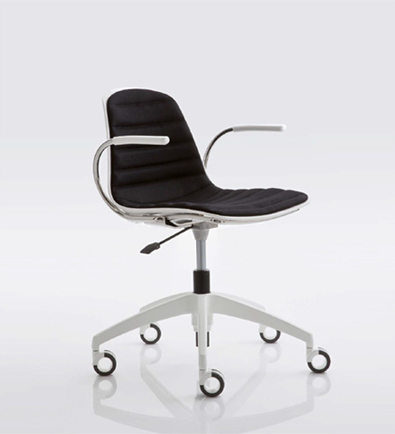 Available with castors or glides. 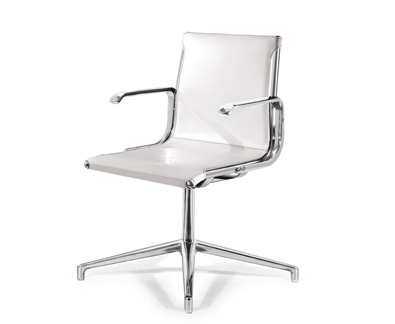 Upholstered chair with cast Aluminum base, chromed structure, adjustable gas lift, eco-tilt mechanism, and fully removable cover in thin padded leather or fabric. 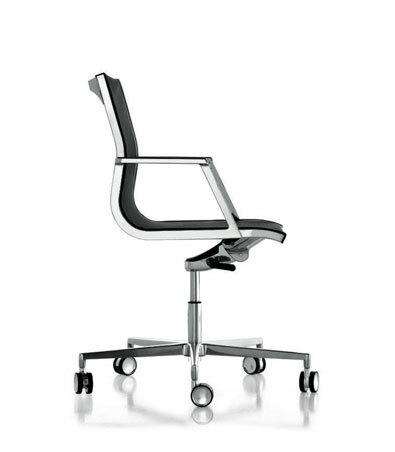 Available with castors or glides. 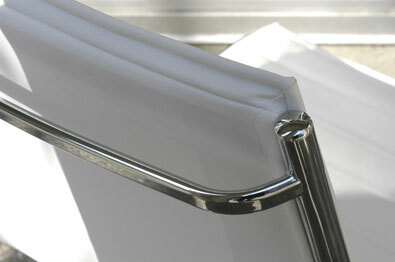 Upholstered armchair in Aluminum, chromed steel and leather. 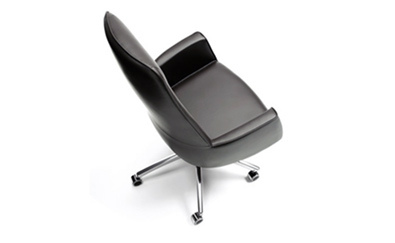 This comfortable swiveling lounge chair features a cast Aluminum base, adjustable head rest, leather covered arm rests, and fully removable cover in your choice of leather color. 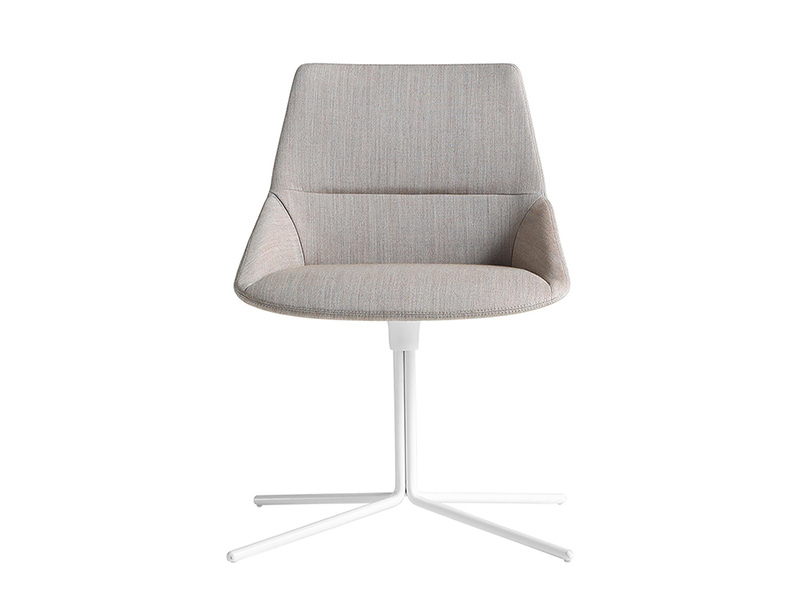 seat height: 15.55" | arm height: 22.44"